Why is District 9 so Acclaimed? 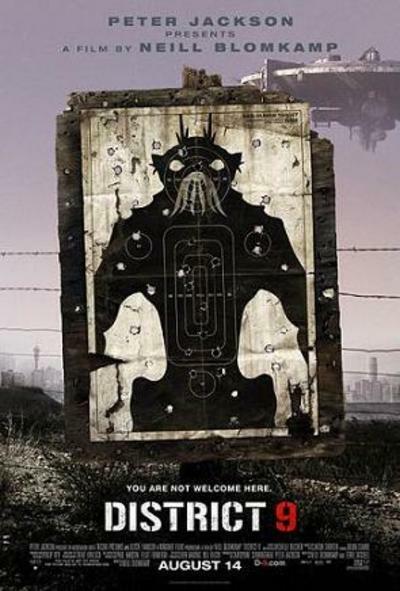 When I went to see District 9, I hated it, so was surprised when it received great reviews from both critics and audiences. Did you like it? What do you think made it so acclaimed? I expect the same reason I hate it, is the same reason so many love it. I don't like all the violence, bad language, and recreation of Apartheid with aliens. What I really hated was the filming style though - how it was done a pseudo documentary with people talking to the camera. I think that's why it was hailed - because it was atypical of usual filming style. Not a fan eh? I liked it. I found the main character interesting. There were so many points in the story where there was an easy and obvious way to redeem him but they didn't and he remained an antihero virtually to the end. Apparently it was based on events that happened in district 8 (I think, it's been a while since I read about it), only with aliens, which I thought was an interesting way to illustrate a subject that's probably still very raw for some people. That probably has something to do with its aclaim. Not everybody likes the shakycam faux docu thing. You have something in common there with the Aussie film critic David Stratton Bryony. I don't mind it, though I think it's a bit overdone these days. It can at times be effective, as in the very scary zombie movie REC (remade as Quarantine because some people can't cope with subtitles). There are a few instances when it works, but for the most part I don't like that style; it takes me out of the film. All I can concentrate on is the way it has been filmed instead of what has been filmed. Nope. The fake documentary style didn't appeal to me. It is not a warm fuzzy kind of movie. It was in some parts quite believable which gave it merit. Very different kind of movie to anything I have seen. actor Sharlto Copley.He did a very likeable man, who just wanted to do his job. You were drawn into his character, and at one stage I felt sorry for the 'prawns', then him, then the 'prawns' and on it went. It was a odd movie, but not too much that you didn't want to go along for the ride. I hope they make another. Like Bryony, I also didn't understand why it got such rave reviews as it did. I thought it was way too graphic and didn't like the general concept. That's what sci-fi often does - looks at today's issues in an alien context. I actually thought it was more about media and it's control over society than anything else. We are definitely a soundbite nation, manipulated by the media because we don't actually think about issues. Which is you favourite Harry Potter Wand? Do you like going to see re-releases?